Seasonal amusement parks are unlocking their turnstiles, greeting guests for months of fun, thrills, and fried decadence. Parents, grandparents, and more than a few adults who are simply young at heart will find their way to an amusement park or two this summer. A day of fun for the family doesn't come cheap. Between admissions, concessions, and souvenirs, the ultimate thrill ride may be taking place in your pocketbook. However, with a little shrewd planning and research, you can make sure that when you're putting your hands up, it's because you're on a daring rollercoaster -- not because you're being robbed. Let's go over a few ways to save some serious coin at the park this season. If you plan to make more than a visit or two to the same park this season, no one needs to tell you about the merits of a season pass. For the cost of two to three individual admissions, these passes grant you unlimited visits. Don't worry if you don't know about this going in. Most parks will promote the ability to trade up from a single-day pass near the turnstile exits. It still pays to plan ahead. Some parks offer slightly cheaper annual passes during the off-season or early in the season. However, what many visitors don't know is that a season pass at one park is often good for the entire chain. This isn't the case at Disney (DIS) or Universal. Season passes for their Florida parks can't be used for free entrances into their California attractions or vice versa. However, Six Flags (SIX) and Cedar Fair (FUN) do offer enhanced passes that cover entrances across the entire chain. A platinum season pass from Ohio's Cedar Point will also get you into California's Knott's Berry Farm, Minnesota's Valleyfair, and any of the company's other gated attractions. Regular Six Flags thrill passes are good across all of the chain's amusement parks. Since regional amusement parks attract primarily locals, the chains know that few guests will be visiting sister parks. However, if you plan to bounce around the country this summer, investing in a season pass is the way to go. Holiday World may be the coolest park you've never been to. The theme park is far removed from a major metropolitan city in Santa Claus, Ind. When you enter the park that is routinely voted as the country's cleanest and friendliest park, you don't feel the tug at your wallet that you immediately experience at the national chains. Soft drinks are free. There's no catch; just step up to any of the self-serve Pepsi (PEP) stations located throughout the park. The attached water park is also available at no extra charge -- and there are free sunscreen dispensers there, too. Holiday World is also one of the last remaining amusement parks in this country that don't charge you for parking. There's obviously nothing wrong with a trip to Disney, but if you're looking to save some money this summer, look into the parks that give you more bang for your buck. Park admissions are a lot like airfares. Two people may be paying entirely different rates to get in. If you drive right out to the park without first hunting for cheaper ways to get in, you'll probably be paying more than a lot of people in the park that day. The key here is to find out if there are ways to score a discount before arriving at the park. If you're heading out to Pittsburgh's Kennywood -- perhaps best known these days as the place where they filmed Adventureland -- stop by any of the area Giant Eagle supermarkets for an $11 discount on a one-day ticket. Seasonal parks often have such deals with select retailers. You're on the Web -- use it! Just do a Web search for the name of the park you're planning to visit and add the word "coupon" or "discount" and make sure the deals are still active for the current season. Nobody likes long lines, and that may be reason enough to avoid hitting a park during peak summer and weekend periods. However, there's as much money to be saved as there is spare elbow room to gain during periods of lighter activity. Holiday World will knock off between $2 to $11 a ticket if you bring in an empty Pepsi can or Bunny Bread wrapper, but it saves its biggest discounts for visitors coming earlier in the season. The lowest $2 discount applies to Saturdays in July and August, when the park is at its busiest. If you're traveling to a park, you will also likely find area lodging to be cheaper earlier in the season. It's all about supply and demand. 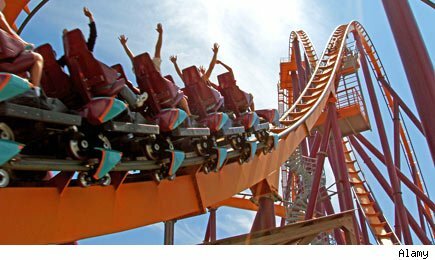 A day at Six Flags Magic Mountain in California can set you back $61.99 a ticket if purchased at the front gate. Buying tickets at the Six Flags website only costs $36.99. The Internet is your friend, and it never hurts to check out a park's official website for ticketing options before exploring discounts that can be had elsewhere. However, the Web 2.0 revolution has also birthed Facebook and Twitter. Check out the official park feeds. The parks will often alert "friends" about area discounts, and some will occasionally have contests for free admissions. Gatorland Orlando in Florida occasionally has photo caption contests on Facebook, with winners receiving four admissions. Cedar Point recently used its Twitter account to announce a promo code -- "bestdeals," if you're curious -- for discounts through its website. Some parks will also allow smartphone owners to opt in for text alerts while they're at the park for deals during the day. The bargains are out there, and there's no sign out front declaring that "you must be this cheap to save" on your next amusement park outing. Longtime Fool contributor Rick Munarriz does not own shares in any of the stocks in this article, except for Disney. He has been running an amusement park directory at ParkOutlet.com since the 1990s. The Motley Fool owns shares of PepsiCo and Walt Disney. Motley Fool newsletter services have recommended buying shares of Walt Disney and PepsiCo. Motley Fool newsletter services have recommended creating a diagonal call position in PepsiCo.